Amelia Levin is Chicago-based freelance writer, cookbook author, former magazine editor and certified chef focusing on food, food service and the restaurant industry. Her work has appeared in a variety of magazines and newspapers, as well as online. Visit her website at amelialevin.com. Once considered a city simply of steakhouses and deep-dish pizza joints, Chicago has morphed into a vibrant and rich collection of second-generation, energetic chefs seeking to forge strong relationships with local producers and the diners they look to inspire. Master Chef Rick Bayless, Stephanie Izard of Girl & the Goat, Tony Mantuano of Spiaggia, and Paul Kahan with his slew of award-winning restaurants are just a few of the top chefs making headlines not only in Chicago’s food pubs but also nationwide. Chicago Chef’s Table is the first cookbook to gather Chicago’s best chefs and restaurants under one cover. Profiling signature “at home” recipes from over fifty legendary dining establishments, the book is a celebration of the farm-to-table way of life and modern Midwestern cuisine. 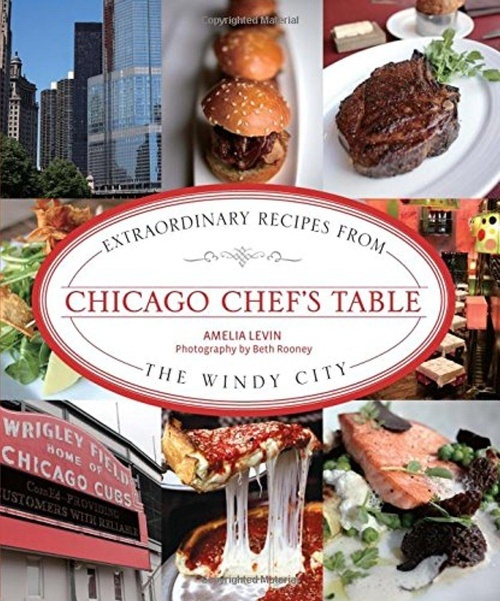 Full-color photos throughout highlight fabulous dishes, famous chefs, and Chicago landmarks. Featuring 125 recipes, plus profiles about people who grow and cook near Lake Michigan, culinary lore, history and geography of the lake, and food travel information.